We are so glad to announce you that Today we launched Helakuru 2.0 - The Intelligent Sinhala Input, revolutionizing the digital Sinhala typing. Helakuru is a Mobile Sinhala Keyboard Input for SmartPhones which we launched on December 2011 & which was the First ever mobile Sinhala phonetic keyboard to type in Sinhala on smart screens. We even won National Best e-Content Award e-Swabhimani 2012 for this innovation & it is used by Sinhalese mobile phone users all over the world to type in their mother-tongue. Now with more advanced & innovative features Today we launched a major update for Helakuru versioning as Helakuru 2.0 as the ever made Intelligent Sinhala Input method. 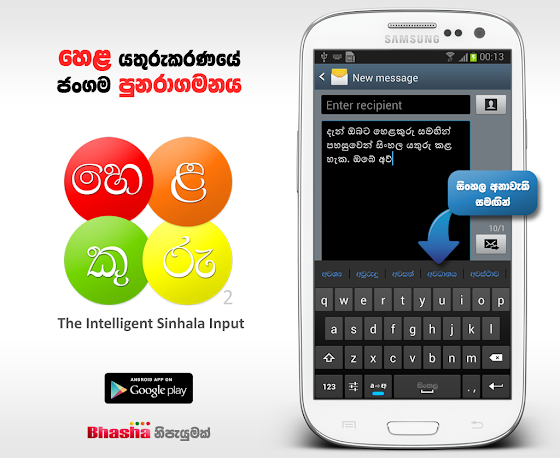 You can use Helakuru 2.0 to type in Sinhala faster than ever with Helakuru Prediction support. Helakuru supports both Sinhala & English Input, so that you even don't need to switch to a different Keyboard to type in English. 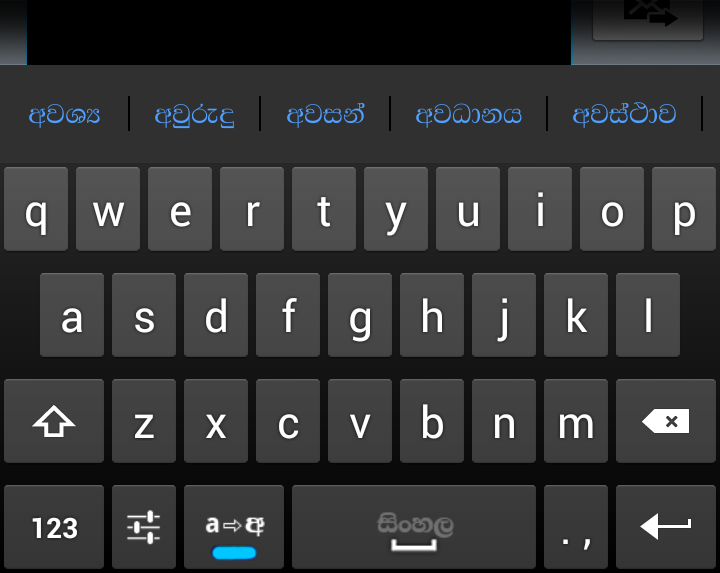 Helakuru uses Sinhala transliteration as the keyboard layout such that you can type Sinhala phonetically as "ammaa" for "අම්මා" in the same way you type SMS in Singlish. It is also a system-wide Standard Android Keyboard Input which you can use to type in any app. Revolutionizing the Sinhala character input mechanisms, Helakuru introduces you the innovative feature Helakuru Predictions (හෙළකුරු අනාවැකි) which enables you to type Sinhala words in just one two taps, without typing the whole words. When you type with Helakuru, this feature will predict the words as you type so that you can just select your preferred word from predictions without typing it entering letter by letter. It will make your typing speed much faster saving your valuable time. Helakuru Prediction also supports self-learning so that the new words you type which are not in Helakuru word database such as person names, nicknames, location names & etc will be automatically saved in to Helakuru database & predict them whenever you type those words again. * Helkauru Predictions is a Premium Feature. But you'll get 30 day free trial before your purchase. 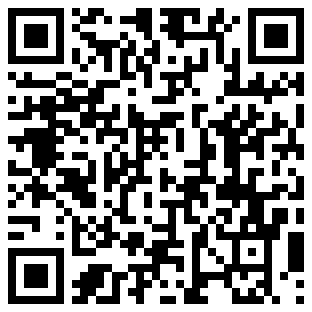 Go to Google Play Sore app from your Android device & search for "Helakuru" or just scan the following QR code from any QR code reader app on your Android device. To make it easy for you to install, enable & switch to Helakuru Input, in Helakuru 2.0 we have developed a step-by-step wizard. By following the on screen instructions of the step-by-step wizard, you can easily enable Helakuru keyboard & switch to it. Helakuru Sinhala Input will be continuously FREE as it was. 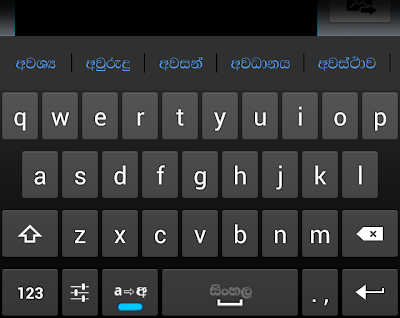 Therefore you can use it forever to type in Sinhala. Helakuru Predictions service (හෙළකුරු අනාවැකි සේවාව) will be offered to you as a premium feature with a 30 day free trial. So that you can try this amazing feature for 30 days & only purchase it if you feel that it'll make your life easy. Remember if you purchase this feature, the money you spent will be not going for a foreign company, but for a truly Sri Lankan company who always offers useful IT solutions for Sri Lankans. If you would like to activate Helakuru Predictions service, you can just follow the following steps. 1. Go to Helakuru Settings from the Settings button on the keyboard or from Helakuru icon. 2. 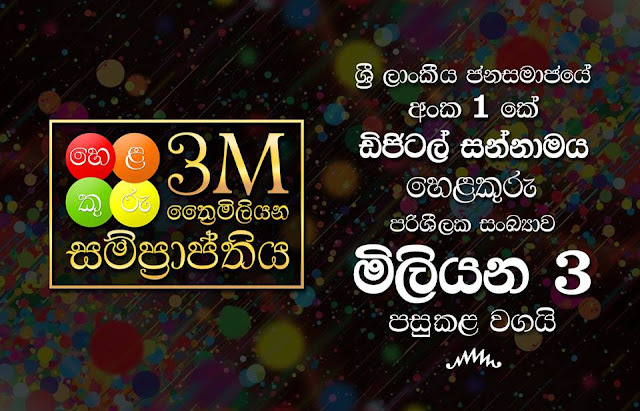 Tap the "මිලදී ගන්න" button in front of "හෙළකුරු ‍අනාවැකි සේවාව". 4. Tap "Pay Now" button. 5. Enter the required details & process your payment. 4. Deposit the amount to Bhasha bank account details given in the page. 5. Email a scanned copy or a photo of your payment slip to support@bhasha.lk. You will receive your License Key as a reply within 24 hours. 7. Enter the required details & the License Key you received & tap "Activate" button. As a company our vision is "Empowering the Masses" & we work from our best to make that vision a reality. This is another effort for that & hope you will use this product for the benefit of you & your country & get the best out of it!